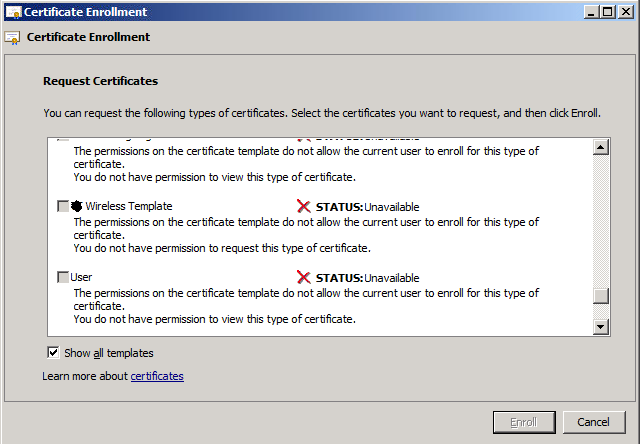 In short, a Certificate Template I want to use is not available for enrollment. The template in question is a copy of the "RAS and IAS Server" template. What's frustrating is that I've gotten this to work during testing, but on production the cert is not available. The only difference between the two is that the production environment was upgraded from a 2003 to 2008r2 forest functional level. No CA before the upgrade. Copy the RAS and IAS Server template. Rename to "Wireless Template" Assign RAS and IAS Servers permission to Enroll / Autoenroll. Here's where it's inconsistent, on the lab server, the "Wireless Template" was available for enrollment. The production server gives me a permission denied message. I will admit that I may have missed some steps while trying to reproduce this on the production server. Both servers are 2008r2 enterprise, with the DC and NPS roles installed. Solved! My server was not part of the RAS and IAS Servers security group..
Not the answer you're looking for? Browse other questions tagged active-directory windows-server-2008-r2 certificate-authority ad-certificate-services or ask your own question.